Playa Flamingo is a picturesque beach town in Guanacaste set between the Pacific Ocean and Potrero Bay. 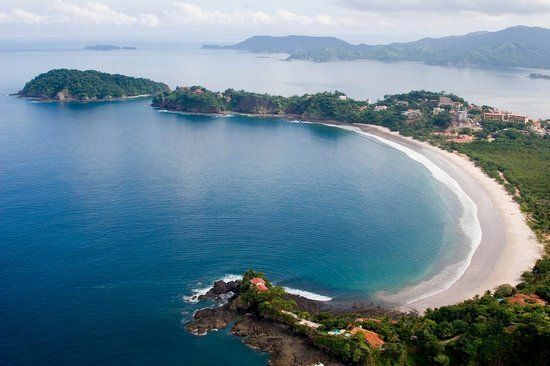 Its northern location makes it the sport fishing, diving and boating mecca on the gold coast of Costa Rica. Playa Flamingo is 30 minutes north of the tourist center of Playa Tamarindo. There is a successful sailing academy in town and a new is marina being built. The Liberia International Airport (LIR) is less than a one-hour drive. There are two distinct beach areas in Flamingo. On one side is the Potrero Bay where all of the boats anchor. The beach is in a small cove, which means that the water is calm so it is ideal for swimming. This is the gathering point for the many fishing and sailing trips that run daily. This is also the area that will house the new Marina, which will be the only U.S. Coast Guard station in the central pacific region of Costa Rica. On the other side is a mile long stretch of white sand with beautiful mangrove that provides ample shade. There are hotels, restaurants, homes and condos that run adjacent to the beach on the other side of the street. There are many luxury homes built on the hillside offering spectacular 360-degree views of the ocean. These properties offer a sense of privacy making them ideal for a low-key lifestyle. You will also find several beachfront homes and condos closer to the town center. Flamingo is the one beach town in the area that has several high-rise hotels and condos creating a city like skyline. Luxury is the word used most often when referring to property in this area; because of this, Flamingo is one of the hottest markets for vacation rental income.